So we need to modify moving mechanism. 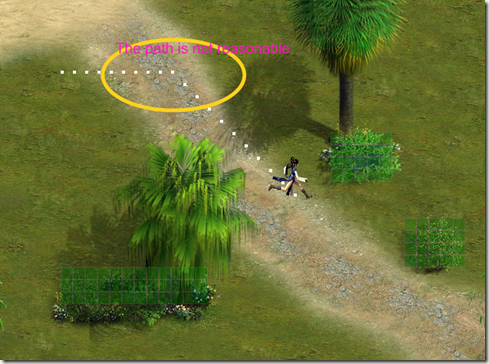 When we click on the map, the sprite’ action is default to move in straight path. And we create a new thread to detect if the sprite meet obstruction during his moving all the time. This time we use CompositionTarget.Rendering, because we have used DispatcherTimer in the sprite’s own animation, we want to distinguish these 2 different threads. If the sprite find an obstruction during his moving, he will use A* algorithm until he walk around it. Then he will move straightly again. This process will last until the sprite arrive the distinction. 1st, pick the color of the sprite’s distinction, if it is not an obstruction, move in a straight way; otherwise, no actions. The functions StraightMove and AStarMove are implemented as follows, please be careful the sprite’s coordinate when set Canvas’s Left and Top properties. Notice, to trace the sprite's moving, we add many white point in the canvas, which will reduce the performance of the game engine. So in the actual programming, please mark it if not necessary, you can find it in the method CompositionTarget_Rendering. Summary: This chapter introduce a perfect moving animation. Our game engine is more and more robust. Next chapter, I will introduce how to Object-Oriented Programming in Silverlight. I will separate the sprite from the main logic. Please focus on it. Chinese friend, you can also visit this Chinese blog if you feel difficult to read English, http://www.cnblogs.com/alamiye010/archive/2009/06/17/1505346.html, part of my article is base on it.